From one summer to the next, Montreal always gets a little bit greener. Revitalized by citizen initiatives, alleys are trading in their concrete armour for a mantle of greenery. “This is what the atmosphere in the alley is like almost all the time in the summer: passers-by stopping to chat, children running around, flowers growing, people getting married!” says Catherine Nawrocka, sharing her wedding photos. In the shade of the magnolias, next to a patch of sunflowers, the neighbours laid out a buffet as colourful as the bride’s dress. A strange setting for tying the knot? Not if you consider your alley, this haven of greenery, to be the perfect place to socialize. “The alley’s soul has existed for a long time,” explains Catherine, who in 2000 settled in the Rosemont-Petite-Patrie borough of the city of Montreal in Canada. 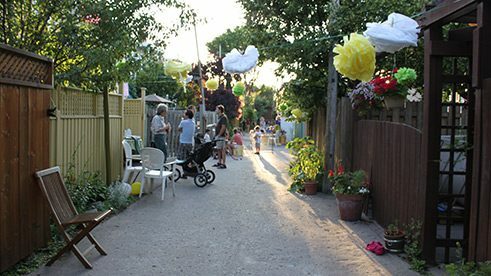 For nearly twenty years a few neighbours have been getting together for a communal meal in the alley at the beginning of each summer. They didn’t have to wait for Montreal’s official alley greening program to be established to plant their flowers and creeping ivy. Historically service roads, Montreal’s alleys (running parallel to the city’s streets and fronting on backyards) became makeshift playgrounds for local children. Paved with concrete or asphalt, many of them also became garbage-truck runs. In the mid-1990s, a handful of residents in the Plateau-Mont-Royal neighbourhood took over a program that the city had launched a few years earlier with only mitigated success, and tackled the job of revitalizing these spaces. The first alley to be officially labelled “green” by the city dates back to 1997. Today there are more than 230 and enthusiasm for the initiative is growing. Starting this year, the Rosemont-Petite-Patrie borough plans to complete about fifteen conversions per summer. And not only are there flower beds, vines and living walls, but also community spaces for neighbourhood meals or outdoor movie showings—greening leads to increased socializing. Very few alleys have prohibited vehicle access completely, as many residents have vested rights to access or even park in the alleys. Greening isn’t any less possible, however, thanks mainly to the use of porous pavers. “When you grow up in Montreal, you’re alley kids—it’s part of your identity,” believes Ève Massicotte, a few alleys away from Catherine’s house. In 2015, she convinced her neighbours to embark on the adventure. Going from the “three or four strong-willed people who want their green alley” to the majority needed to make the project official and begin the actual work required patience and strength of conviction. But the result was worthwhile. “Undertaking community projects with your neighbours requires most of all that you get to know one another,” explains her partner Nicholas Legault. “We don’t have to go after citizens—they are self-motivated,” observes Roberto Garcia. To those who come to him seeking start-up support, he requests that they first form an alley committee, which is responsible for informing and surveying the people of the neighbourhood. At least three-fourths of the residents have to have been consulted, and a majority of those consulted have to approve the project. The borough takes care of excavation work and provides the soil, while planting and maintenance fall to the residents, under the responsibility of the alley committee. “You need a good dose of persistence to keep a green alley alive and you have to be committed enough to avoid getting discouraged,” adds Catherine Nawrocka. In winter, the flower boxes are regularly ruined by snow plows, vines are sometimes ripped out by passers-by, etc. Her neighbour Pierre Bonenfant believes that it wouldn’t take much for “the whole thing to be abandoned. The commitment on the part of volunteers is sporadic. We need a few guiding lights if we want to stay afloat.” These beacons are the Catherines and Èves of this world, staunchly motivated and optimistic. Because beyond the effort required to convince the most sceptical, a green alley is still a plus for the community. Sophie Mangado works as a freelancejournalist in Montreal. She writes mainly for Quebec-based magazines, both foryoung audiences (Curium, Les Débrouillards) and adult readers (Reader’s Digest, Affaires+, Métro), but also contributes todocumentaries as an investigative journalist. Copyright: This work is licensed under a Creative Commons Attribution-ShareAlike 3.0 Germany License.